Shout! 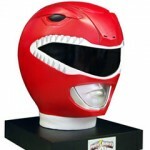 Factory has reported a production delay in the Power Rangers Legacy boxset, due to a potential quality issue in the helmet design. Previously scheduled for release in December, the new official release date is January 2nd, 2014. Fans will just have to wait a bit longer to own these first twenty years on DVD.